His response was a bit of a surprise. Yukimura doesn’t do many suspensions and is known for his floorwork and caressing style, far more than suspensions. So when he told us that eventually our lessons would include suspensions as part of Yukimura Ryu, we were more than a little surprised. He started off by explaining that when he was younger, he did a lot of them, but soon everyone was doing them and he wanted to be different. They were becoming a signature of Nureki and his feeling was that he should do something unique. He went on to explain that suspensions put limitations on how you can connect with your partner. When you play on the floor, the range of communication, expression, and connection is unlimited and your play can range from soft and sensual to sadistic. Suspensions, he told us, are always “seme” (hard play). Then he started to show us something amazing. 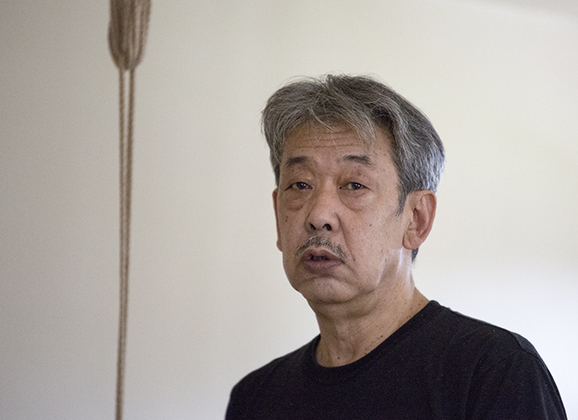 He tied our model, Aya chan, into a kata ashi (single leg suspension) and talked about exposure, shame (hazukashii) and the various ways women will try to hide themselves while tied. There is a natural tendency, he explained, to bring the knees together and even though it is difficult and doesn’t cover much, there is a kind of psychological comfort from trying. And then he adds another rope and she is up, suspended in a full M-gi, legs open with nowhere to hide. Her reaction transforms immediately and we can see on her face, exactly what he is talking about. From struggling to full on shame–nowhere to hide. Suspension, he explained, should emerge as a natural and organic part of what you are trying to accomplish and, in this case, it was a response from the model trying to hide herself and resist the exposure that made the suspension work. The point for Yukimura is there are some good reasons to do suspensions, but doing them just for the sake of doing them isn’t enough.